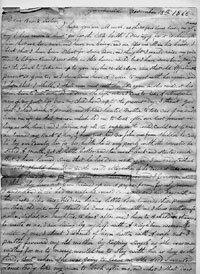 In November 1866, Ralph Daykin wrote a four-page letter to his brother Joseph and wife Ann (nee Woodward) in Ohio, USA. Ralph tells Joseph how much he thought of their mother, Elizabeth, and his brother James, who gave him considerable help and 'put me in the way of Clock & Watch repairing'. Another brother, John, residing in Shildon, County Durham, is described as being in poor health and having a less-than-perfect family. John did benefit, however, from spending some time with Ralph in the dales. In this sad letter, Ralph describes feeling 'rather lonely' and explains that his hearing is deteriorating. He thinks it won't be long before he loses it altogether but looks forward to a better life in the next world. I have just had Bro John over from Shildon he came to try our Country air for his health he is only poorly with the asmatic he staid A month, got A little better and then went back and started work But I have learned since that he has Done working and I am ready to think he will shortly have done in the world altogeather if he Does not take more care of himself, his family apears to Dow him now good and I fear never will. I think they have not been trained up in A proper form, for why, Because I understand if he had no wife he would come and end his Days with me this looks like his children having little love towards their parents in their old age, why should he come and live with me I have neither wife, mother, sisters, nor Daughters to look after me. I have to Behold on strangers to waite on me. I am living by myself with A neighbour woman to waite of me. I think I should of been better with A wife but I partly favoured my old mother by keeping single as she was never willing for me to marrey, wanted me to stay with her as long as she lived. But when she was going to leave me she said I wanted some Body like my own to look after me. and what I shall Dow yet it remains to be seen, now I am writing to you as one that loves you and I love you very much although I have not been much aquented with you. you left for America when I ws only little. I very well remember of you stiliting the Swale with me on your Back and I think one of the Stilts nogs Broke and in we Both went, my mother thought a great Deal about you , It seemed as if she thought more about you than any of us. I well remember when you sent her some money it nearly fed her an inch at Rib when ever I was writing American letter she would say is that letter for Josey if it be for Josey write A senseable letter and thou must tell him that we live very comfortable and Happy togeather and if I had not thee I Dont know how I should of Done. had I left mother it would of Broke her heart and I dow not rue for what I have Done. I only rue that I have not Been more kinder and lovinger. she has Done her Duty to me and I have nothing to lay to her charge and I hope she has got to A land of rest. it apears that the Devil knew I loved that parent and we have had many a Battle about her latter end and I have A Brother or rather A father if I may be allowed to say so. I mean Bro James I love that Bro as Dear as my own life if he was Destined to be executed I could freely offer up my life in his stead. he trained me up in that loving maner which inables me at this time to express my mind to you as I dow. he learned me to write as yous ee. he put me in the way of Clock & Watch repairing he always Gloreyed to raise me up higher than himself. Generaly consulted me about anything and if my plan was Better he took it and we moved on in A loving way tried to present each others good, it is one of the finest things in the world for love to Dwell in training a family. I Believe A great Deal in love. I understand that love is the fulfilment of the law. I sent you A newspaper some time since with 2 cards folded up in it. one on the Death of mother, the other of Father. Did you get it. I sent James one with cards as well. I intend sending 2 cards of my likeness they are only comon as I was not fully prepared for taken at that time. I cannot send in this letter. But will send them in Bro James letter then you can get one and see partly what kind of A fellow this writer to you is like. I am glad to understand that my sister Betty is well and more so to hear of her rapit progress for Another World. it Does me good to hear of sister or Brothers making their calling and Election sure, I have Been A member of the Wesleyan Society now for about 18 years. I was in Before But I fell away. started when I was about 8 or 9 years old moved on till about 17 or 18 years old. fell Back A short time and then started again. and I ope to move on till the end. although I have had my short comings and Dear Brother I can say that I love every Body, if I had it in my power I would Bare the Bigest enimy I have in the world to Glorey, if I was to Die to Day I have no Doubt of my acceptance with God. I love Christ and I long for Glory. why comes all this to pass, I look A great Deal in my upbringing. I had A kind and an Affectionate Mother and A Dear loving Brother, may God reward that Brother for his training me up in the way he has Done. I well remember when last we parted he striped his jacket of his back and put it on my Back, and took my old tagley something like A kitle, I know that he has an open heart. I have just sent A long letter to Bro John all about making preparations for his latter end and I shall not let him rest much till I hear that he is Doing so. Just at this time I am going about seeking Clocks & Watches to repair I was traveling by A place yesterday they were Buisey making Hay, it had been hard frost and plenty of ice shokels the night before. the hay time has not been good this year, we have had A great Deal of rain, and I fear the Harvest is rather A failer. we have at present A very good mine at Buntin, old Gang, the others mines are Doing little good, you will likely understand the old chapel is pulled Down and A new Chapel Building. the old one was too little the new one will be large and more splended. it will be Built just behind the old one at an estimated cost of 7 or 800 pounds. Rather A large sum to raise in this locality. Chiefley been all miners and in himble Circumstance. But I am not going to Dwell much on Country news. I want to relate A little of my appearence. if their be anything you want to know I shall be most glad to inform you if you only mention it. I am at present getting very Dull of hearing. I expect at the rate I go in A short time to loss it altogeather. I find it to be A great let Down for me I could fill you A newspaper what I have sufferd on acount of lossing thes presaress sence. loss of hearing and loss of Mother it has taken very great hold of me. But I find that God Gives me more grace and strength in preparation to my Day. and I shall try to weather out every storm to see my Savious face at last, and I hope to meet parents, Brothers and sisters where their is fulness of joy and at Gods right hand pleasures for ever more, may God grant that this may be all our happy lot and portion. now if I have Done or said anything amiss to either Brothers or sisters I humbly beg pardon. and Rather than any of my Brothers and sisters should miss their provedencial way, I am hear and ready and willing to sacrifices my life if it would save them. when my old mother was going to Die, I prayed for the Lord to lay nothing to her charge. if their was anything I was willing to take it on my Back. and I prayed for him to punish me and let her go free. I am willing to take all the Burdens of either parents Brothers or sisters. I am willing to lay Down my life to save any of them. now Bro this all comes from the Bottom of the heart. I am not waiting flaterers God forbid. I have had of Good training up in love. and I know that love is the fulfilling of the law, and I am trying to love my neighbour as myself. when you get this letter just return A newspaper in answer to it and I hope when you can spare time to write send A few lines to know how you are getting on and if any Body find fault with my writing or Bad spelling tell them I never had six pence paid for my Education. I sometimes went to the night school instead of Bro Joh when he could not go and it was only odd times, if their is A word wanting put one in as you read. I shall not write much of A letter to James as I intend to send some portrates 2 of myself, one of Bro John, one of Sister Ruth son and one of our Artist Sunter, now Bro I shall Draw to A conclusion and I hope Both you and your wife and all the family is well and Doing well. I could very much like to see you Both But if we never have the Happyness to see each other again in this world, I hope to meet you Both in heaven.